Finding listening devices using this Bug Detector is recommended when clandestine bugging equipment is suspected of invading your privacy indoors or outdoors. This Bug Detector is unique in searching for clandestine bugging equipment because the eavesdropper who deploys listening devices may be trying to prevent detection by using a high frequency listening device, possibly transmitting at the 4 GHz range, or even at the 5.8 GHz range. Unique Feature: This Bug Detector searches for bugging equipment in the frequency range of 1 MHz to 6 GHz. 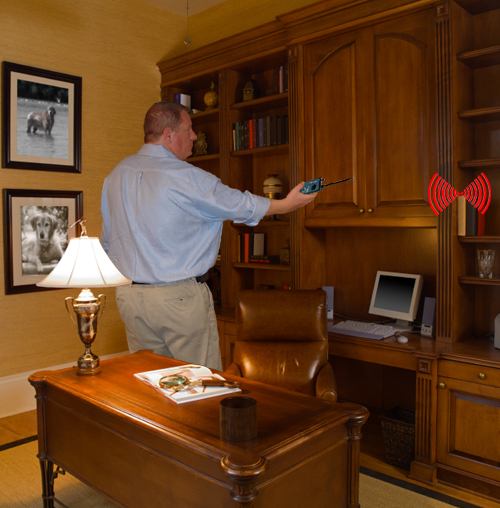 Most bug detectors search for RF bugs in the range of 1 MHz to 3 MHz, yet this bug detector offers an extended range of coverage. This extended coverage is offered in order to detect and find listening devices that may operate on 5.8 GHz, a threat that is found from portable phone frequencies, or bug transmitters that have been made from 5.8 GHz portable phone circuitry. Graphic Indicator: Bar Graph readout used to reveal the increase and decrease in transmission signal strength in relationship to the proximity of the search area for listening devices. Alert variations: The Bug Detector has a silent alert mode, using vibration, and an audio alert mode, using tone sounds, to notify the user when a listening device may be active in the vicinity. Wireless Camera Detector can find hidden cameras during its camera detection sweeps that involve scanning for signals generally used by wireless video transmitters. Q: What makes this Bug Detector a good choice compared to other bug detectors? A: This Bug Detector is able to cover a broader range of the spectrum where radio signals broadcast on. This Bug Detector has a Graphic Indicator, helping you to actually see the signal strength of the radio transmissions in the area under examination. This Bug Detector has a quiet alert mode in the form of a vibration alert so as not to inform anyone that you are examining the area for threats to privacy. Q: Where would this Bug Detector be used in? A: It was designed for use in home and office environments, for people who want to 'do their own sweeping' with a personal privacy bug detector. It can operate indoors our outside. Q: How close to a bug or rf transmitter do I need to be in order to detect it? A: Because the strength of each transmission may vary, the closer you are, the better it will be to pick up the signal. Proximity can range from 5 feet to 30 feet away. It is also important to consider that microphone sensitivity of most transmitters may be able to collect sound from up to 30 feet away. may ship the next business day.